The bigger picture may look rosy, but it hides the fact that default rates among the poor majority are increasing. Johannesburg - It seems incongruous. With the economy shrinking in real per capita terms and government finances deep in crisis, South Africa’s consumer debt situation is looking better than it has in years. During 2017, household indebtedness as a share of disposable income, stayed on its downward trajectory since the crisis of 2007. This metric of financial stress was at its lowest level in a decade, at the time of the latest data up to the end of June. 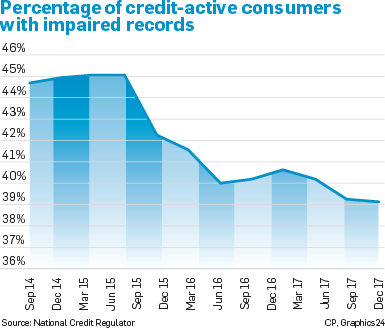 Credit bureau data collected by the National Credit Regulator (NCR) shows that the proportion of South Africans with impaired credit records is still falling. At last count, 39.1% of credit consumers visible to the formal system had an account overdue – the lowest level in years. But weak spots are starting to show and a lot of the population’s debts don’t show up in the credit statistics, including debt to loan sharks and the staggering levels of arrears in payments to municipalities across the country. The one conspicuous problem in the formal credit data is long-overdue credit and store cards. According to the NCR’s data, the amount of credit and store card debt in deep arrears of over 120 days is rapidly growing towards the R18 billion mark. All other forms of credit are seeing arrears levels that are either stable or improving. Analysis by major credit bureaus shows how the rosy aggregate picture obscures problems building up in some segments of the consumer base. The problem with these aggregate data is that they are dominated by the relatively large and healthy debts of the rich, particularly mortgages. This hides deterioration in the credit situation of the poor majority. One attempt to differentiate is Experian’s Consumer Credit Default Index which measures new, “first-time” credit defaults in 36 different consumer categories. Its most recent edition, published in November, shows the same overall pattern of improvement, with a drop in the total rate of new defaults. It shows how poor South Africans are simultaneously experiencing a steady deterioration in their credit health. Between June and August 2017, accounts worth about R13.13 billion defaulted for the first time. This represents 3.44% of outstanding debts. By comparison, in the same period last year, 3.61% of all balances defaulted for the first time. This then amounts to an improvement in South Africa’s overall credit health. 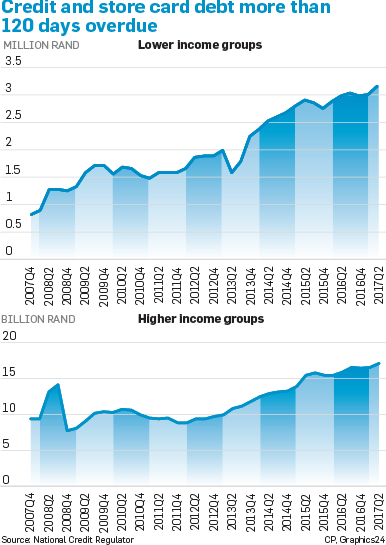 However, when one drills down into different income groups, the picture changes dramatically. At the bottom of the pyramid, default rates are in fact increasing even though this affects a far smaller amount of outstanding credit. “Indigent township families”, a category that Experian applies to about 3.86% of the population, are clearly under stress. 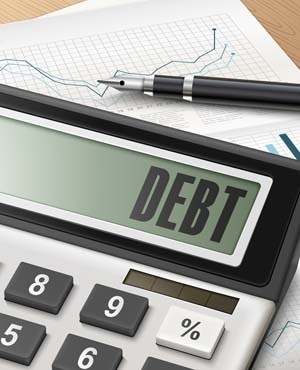 These families saw new defaults on R161 million in debt, or 7.93% of their total debts. That is significantly worse than the 6.81% Experian measured for the same category a year earlier. When it comes to personal loans, the indigent township families fared even worse. They saw 11.52% of the outstanding balance of personal loans default for the first time, compared to 8.68% last year. This significant deterioration barely makes a mark in overall statistics, but shows that trouble is brewing at the bottom of the South African income pyramid. Another private sector index, the TransUnion Consumer Credit Index (CCI) uses credit bureau data, particularly related to credit cards, to measure whether consumers are distressed. Like business confidence indices, the CCI has a “neutral” level of 50. A score above that indicates improvement and a score below shows growing distress. The latest CCI, released in November, gauged overall consumer credit health to be almost imperceptibly improving, with a score of 53.9. “Despite some encouraging trends in the industry in the past few quarters, we have been cautioning for some time now that low economic growth, high unemployment, low wage growth and uncertainty in a volatile global economy all pose significant pressure and risk for consumers,” said Lee Naik, chief executive officer of TransUnion South Africa. The CCI relies especially on credit card data to gauge “distress”. The logic is that growing use of credit cards to augment spending shows people are in trouble. “What’s encouraging is that utilisation has fallen slightly over the past year,” said Naik. The number of defaulting consumers is also declining, but that should not distract from the fact that there are millions of credit accounts in arrears and that the aggregate data can obscure what’s happening to the poor. 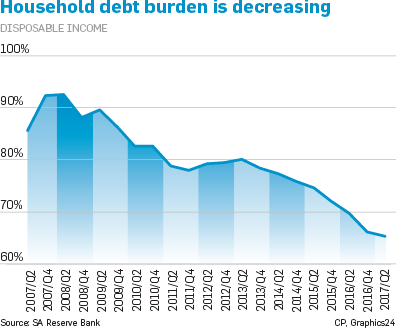 “Typically, wealthier households have far more manageable debt loads,” said Naik. Are you overindebted? How do you plan to tackle the problem this year?